Throughout Israel, one finds a variety of toilet flushers. Most of them round and split. A small button for liquid waste and a bigger button for the heavy crap. Although these are quite foreign from those found in America, none of them came with directions––neither in Hebrew, Arabic, or English––on how to use them . . . except for one. Bwaaa! I'm glad they told us because we Americans have no idea how to use this kind. As a side note, if this sign had been written for Israelis at this tourist site, it would not be in English. Oh we have these in Singapore too! If it is closer to the floor, it's meant to be stepped on down.. don't use your hands. How funny! Yes, i've seen the "half button" type here, but it's not very common. That's so funny! Instructions for Americans. So funny! In Europe, there are lots of the double button flush toilets. I wish we had them here! Well, I would think something like that would be pretty self explanatory don't you think??? :) Have a great evening. There is something funny about toilet instructions in any language. I have to admit, that was funny. 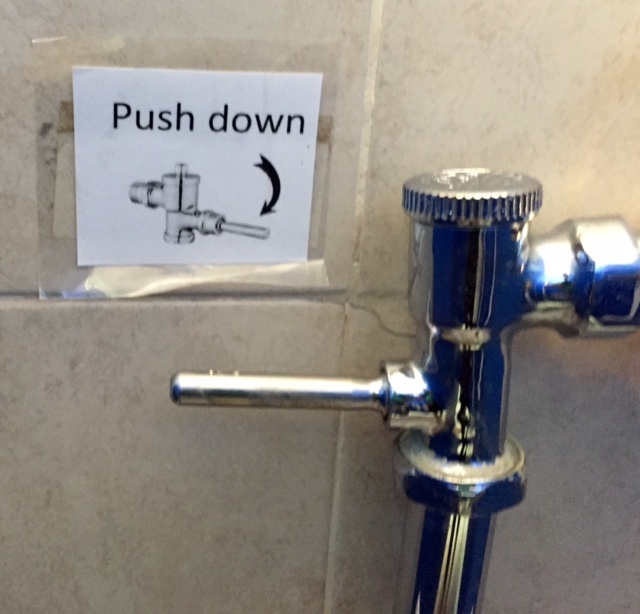 Things I have never thought about before, differences around the world on how to flush a toilet. I think flushers are a mystery to a lot of people. lol isn't that how that goes!! Love it - needing instructions! How stupid are we all? ?